Because time is a funny thing, it has officially been ten years since Iron Man launched the now-iconic Marvel Cinematic Universe, and to celebrate, Marvel just released the most spectacular class photo of ALL TIME. 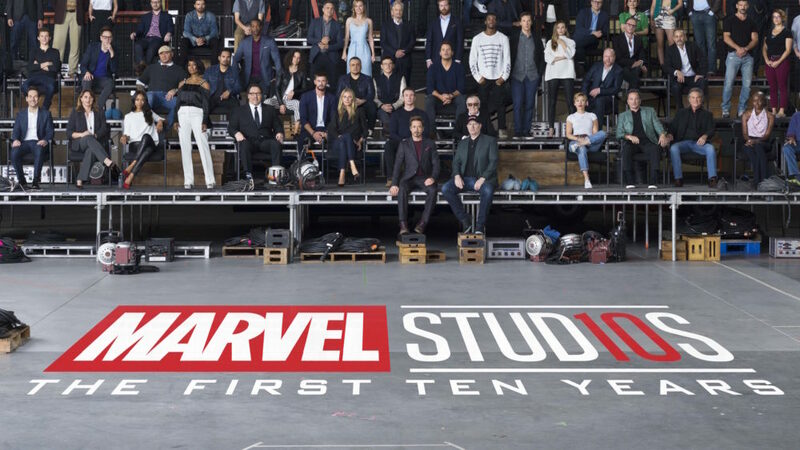 In a move that’ll put every yearbook photo to shame, Marvel pulled together a resounding 79 key players — stars, producers, directors, and writers — from the first decade of the MCU for a single photo. Gathered around the long-time hearts of MCU: Robert Downey Jr, Chris Evans, Marvel Studios president Kevin Feige, and iconic Marvel writer Stan Lee are the rest of our Avengers, the Guardians of the Galaxy, and the many, many supporting people who’ve kept the often reckless superheroes alive thus far. But while just looking at the photo gives us chills, Marvel also released a minute-long behind-the-scenes video from the shoot, and it’s the Marvel movie we’ve been waiting for. It turns out, literally every single person in the photo had exactly zero chill during the photo shoot — because they were too busy fanboying and fangirling over each other. Brie Larson’s jaw dropping upon entering the room just about sums up how every single person was feeling. "It felt like being at the Academy Awards or something. Every person had been in one or all of my favorite films," Thor himself, Chris Hemsworth, explained. "I think everyone was aware this was coming to a close. We'd all been on this remarkable journey together. There was a huge excitement and buzz to that day." But Marvel isn’t just celebrating a decade of MCU with its stars, it’s also launching #Marvel10YearSweepstakes, in which participants can share their favorite memory on a particular MCU movie of the week, for a chance to visit the Captain Marvel, Marvel Studios, Disneyland, and a lot of other perks. Find the official sweepstakes rules here. We can’t believe MCU is already turning 10 — and cannot wait to see how it celebrates turning 20!! Meanwhile, we’ll find nearly all our favorite heroes from the class photo facing off against Josh Brolin’s Thanos in Avengers: Infinity War in May.